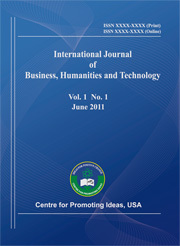 CPI runs International Journal of Business and Social Science, International Journal of Humanities and Social Science, International Journal of Applied Science and Technology, American International Journal of Contemporary Research (AIJCR), and International Journal of Business, Humanities and Technology (IJBHT) for creating a platform to share the thoughts of professionals, scholars and academicians throughout the world. The journals are published from USA under the direct supervisions of renowned academicians of the world. The quick review process, rich editorial boards and quality publications have already made these journals unique.